Cars made by Japanese manufacturers are still the most reliable, according to a survey by Which? Car magazine. They took the top seven places for reliability in a table compiled after a study of 90,000 vehicles. 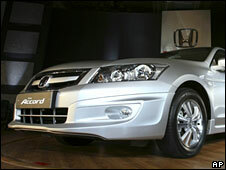 In the manufacturers' table, Honda came top, followed by Toyota, Daihatsu, Lexus, Mazda, Subaru and Suzuki. Although Honda topped the makers' charts, its Civic - made in Swindon in Wiltshire - came joint bottom in the list of reliable medium size cars. The manufacturers at the bottom of the rankings were Chrysler/Dodge and Land Rover - the UK firm recently sold by Ford to Indian conglomerate Tata - which were classed as "poor". "Japan continues to show the rest of the world how to make consistently reliable cars, although the new Honda Civic shows they're not infallible," said Which? Car editor Richard Headland. The survey reports on nearly 90,000 cars made across the globe. I have had the same Mini Metro since I bought it from new in 1985. The "Most reliable car brand" survey looked at cars up to eight years old while the "Most reliable car model" used data on vehicles up to two years old. Among the marques praised included Skoda - owned by Volkswagen. "Skoda out-performs Seat and VW itself," the report said. "So much for being the budget arm of the VW Group." And it noted that expensive German brands, including Audi, BMW and Mercedes-Benz all fell into the "average" reliability category, "suggesting there's still some way to go to ensure their well-engineered cars remain dependable over the medium and long term".